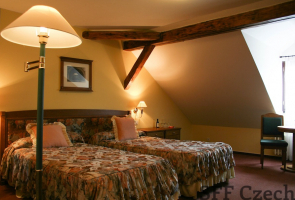 Hotel Leonardo, which offers you stylish accommodation in the very heart of Český Krumlov only thirty metres from the central square and ten minutes' walk from the chateau in Český Krumlov. 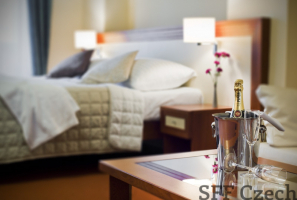 The hotel offers short-term and long-term accommodation. 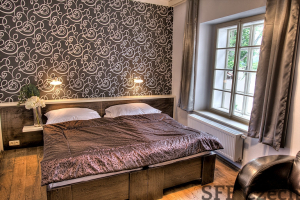 While enjoying the unique architecture of this historic town on the Vltava River in the southwest corner of the Czech Republic, stay in "Castle View Apartments" and be only 120 feet from the town's Main Square. Spending the night, you will see the town in a very different "light" than the busloads of day tourists. Hotel Riverside is an enchanting hotel in the heart of Cesky Krumlov, situated on the banks of the Vltava River with a view of Cesky Krumlov castle.The quality and elegance of our rooms and suites offer our guests the perfect environment for rest and relaxation. The hotel stands in the very centre of historical Český Krumlov, just a couple of minutes' walk from the main square and Český Krumlov castle. The hotel building itself, which dates back to the 14th century, is one of the most significant historical monuments of Český Krumlov. 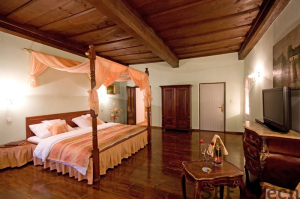 Hotel Peregrin is located in a house of medieval origin dating back to the 15th century. 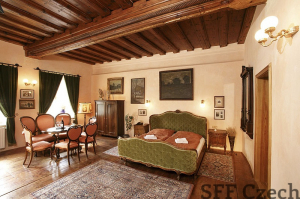 We respect the unique historic value of the building and combine it with modern furnishings and design objects in an original and harmonic fashion. Hotel Dvořák is located in the historical center of Český Krumlov, and its rooms offer a unique view on the Vltava River, and the magnificent castle panorama.There are 22 luxurious rooms with 44 beds, and 9 extra beds available at hotel. The Bellevue hotel in Český Krumlov is situated in close neighbourhood of the state castle and chateau Český Krumlov, in the heart of the monumental zone that´s written on the list of UNESCO world cultural and natural heritage.